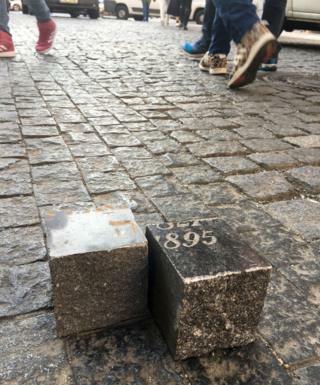 Each year millions of visitors walk through the cobbled streets of Prague’s Old Town — without realising, most likely, that many of the stones below their feet have been looted from what was meant to be sacred ground. The BBC’s Rob Cameron only recently learned their secret. We stood, blocking the pedestrian traffic, on one of the busiest streets in the Czech capital. A steady stream of people pushed by us muttering as they clutched bags of Christmas shopping and souvenirs and we peered at the ground. In the distance, at the bottom of Wenceslas Square, crowds congregated around street performers and kiosks selling sausages and beer. "There," said Leo Pavlat, the owlish, bearded director of the Prague Jewish Museum, pointing at a thin strip of dark, square cobblestones at our feet. "There! You see? All along there." He looked up, his eyes following the strip as it ran along the short pedestrianised street. He delved into a plastic bag and brought out two cobblestones. They were almost identical to those embedded in the ground below us. But these ones you could turn over in your fingers, revealing a single smooth side of polished granite that would otherwise have been hidden face down. One bore fragments of a date, 1895. The other featured three letters of the Hebrew alphabet — he, vav, bet, the gold paint which lined the chiselled inscriptions glinting in the winter sun. "What does it mean?" I asked. "Is it part of a name?" Leo frowned. "No idea. It’s not enough to tell. Possibly it’s part of a eulogy." Leo Pavlat has owned these stones for more than 30 years, ever since he slipped them into his pocket one spring morning some time in the late 1980s. "It must have been shortly before Gorbachev came, because I remember they redid the cobblestones here especially for his visit," he said. Later I looked online and discovered that the Soviet leader first visited Prague in April 1987, and the trip had indeed included an hour-long walkabout at the bottom of Wenceslas Square. But back to Leo and his cobblestones. On that spring morning just over 30 years ago he was on his way to work in the Albatros children’s publishing house, a short distance from where we now stood. He’d passed a sight that’s still familiar in Prague today — piles of new cobbles waiting to be laid by workers in overalls and kneepads. Something about them caught his eye, and he bent down for a closer look. They were fragments of Jewish tombstones that had been cut into perfect cubes of granite. Judging by the dates, they’d been taken from a 19th Century cemetery. Shocked, Leo pocketed a few and walked briskly away. "It wasn’t easy being Jewish back then," he told me. "I was an active member of the community, though not in the official circles. And I wasn’t a member of the Communist Party." Even attending the officially-sanctioned weekly service in one of the few functioning synagogues was enough to prompt a chat with the secret police, he said. "There were no publications, no education. I think the regime just wanted the Jewish community to slowly die." Czechoslovakia’s Jewish population of some 350,000 people before World War Two, was reduced to about 50,000 in 1946 — including the few who had staggered back from the concentration camps. Official anti-Semitism and voluntary emigration followed during the decades of communism. By the late 1980s, the population barely numbered 8,000. And across the country, on the edges of villages and towns, some 600 Jewish cemeteries lay untended and forgotten. The Communist authorities — and, it seems, the leaders of the Jewish community too — saw them as repositories of valuable building material that would otherwise go to waste. Leo Pavlat couldn’t remember where his stones had come from, but directed me to an article he’d written several years before. His cobbles, it seems, were cut from tombstones taken from a Jewish cemetery established in 1864 in the town of Udlice in North Bohemia. There’d been a Jewish community there since the 17th Century, with a synagogue, yeshiva (a religious school) and two cemeteries. By 1930, the Jewish population of Udlice had fallen to 13. By the 1980s, when its cemetery was looted, it was — presumably — zero. After a few minutes’ walk, we reached the end of the granite line, at the bottom of Wenceslas Square. Tourists and locals jostled past us. I asked Leo what he wanted the city to do. "It’s not easy. The gravestones can never be put back together, and laying new cobbles would cost millions," he said. "I don’t think it was done deliberately by the Communists, to offend us Jews. But it is insensitive." He’d like the city to put up a small plaque. A plaque that would remind people, he said, of the once vibrant Jewish life here. And the barbarism of the Communist regime. When Alexander Bodin Saphir’s Jewish grandfather was measuring a high-ranking Nazi for a suit in Copenhagen 75 years ago he got an important tip-off — the Jews were about to be rounded up and deported. Did Denmark’s Nazi rulers deliberately sabotage their own operation? Join the conversation — find us on Facebook, Instagram, YouTube and Twitter.